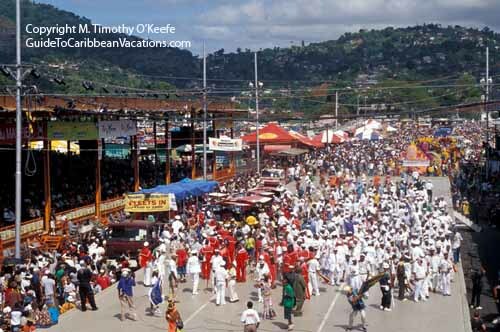 On Carnival Tuesday the bands parade across the same center stage used for the steel band and costume competitions on Sunday night. With a hundred bands or more in the parade, and several hundred participants in each band, it takes most of the day before all the groups have passed in review. Spectators watch either from the roadsides leading to the stadium or have a reserved, shaded seat on two sides of the stage. Every band has its own theme. This is one of the less imaginative bands using the theme "Fleets In," the reason for the mundane sailor costumes.